Gardening is one of those things that everybody can do. Growing your own vegetables can give you a priceless sensation, not to speak about the wonderful feeling of tasting your own biological crops. However, many might think that growing vegetables require a lot of space, a good terrain and a lot of time. If you are part of those who think that a balcony is not enough for gardening, I have good news. Today, I’m going to speak about the Square Foot Gardening, a concept that makes gardening accessible to everyone. The good point is that you generally don't even have to worry about getting out your string trimmer to get rid of those nasty weeds that may be infringing on the space of your vegetables. So, if your dream is that of having your own garden, but you don’t really have a garden or much spare space, read this Square Foot Gardening: The Ultimate Guide and find out how to grow your own biological vegetables in a box. How To Plant The Crops? Square foot gardening is a gardening style invented in 1981 by Mel Bartholomew. This gardening style consists of planning and creating small “one square foot” gardens in wooden boxes, known under the name of raised beds. Square foot gardening is ideal for those who are new to gardening as well as for those who live in areas with poor soils. Usually built up in a raised bed, the square foot gardening also represents a valid option for those who would love to grow their own vegetables but don’t have a garden. But how is a square foot garden made? Basically, the inventor of this type of gardening recommends using a square of at least 4 x 4 feet. The square is then divided into sixteen one foot squares with the help of a grid. In each square should be planted a different species of vegetables, while the grid will divide the space and guide you during seeding. Depending on the type of the vegetables you want to grow you can determine the number of the plants that go in each square. For example, you can plant one tomato plant in a full square, four strawberries, two pole beans and so one. Basically, the size of the plant will determine how many plants go into a single square. The position of the plants in the garden is also important. You should place tall plants in the northern side of the garden if you live in the northern hemisphere, or in the southern part if you live in the southern hemisphere, in a way to allow the sun to get to the other crops. The square foot gardening concept is so simple that more and more gardeners start using it even for large size gardens. There is no doubt in why they prefer to divide their gardens into one square foot squares, because, in addition to organizing the crops, the square foot gardening also presents other advantages. The main advantage is definitely related to the maintenance ease of such gardens. In fact, the densely populated areas generally prevent the weeds from germinating, therefore there is less maintenance work required. On the other hand, you will also have the opportunity to plant some pest-repellent ﻿﻿plants in the middle of your crops. In this way, not only that you will have to worry less about maintaining your garden, but you will also be able to grow biological crops since you will not have to use any chemical pesticides. Lastly, the large variety of crops will prevent plants from getting diseases and will also prevent plant diseases from spreading. While the square foot gardening can be practiced anywhere, even directly on the ground, Bartholomew recommends using raised beds for building the garden. The reason is that the raised beds can be filled with potting soil, so even if the soil in your area is poor you can still create the perfect conditions for growing your crops. If you don’t know how to create a square foot garden, read on and discover how to build the garden and how to choose and plant the crops. Depending on your preferences and space, you can build a square foot garden from a diversity of materials that go from plain timber boards to concrete and bricks. The first thing to have in mind is that the minimum dimension recommended for a square foot garden is 4 x 4 feet. This size of the garden can be divided into sixteen square foot squares, giving you the possibility to create a vegetable garden in a rather reduced space. However, if space is not really a problem for you, you can even build a larger square foot garden. However, it is still recommended to maintain a four feet width and only extend the length of the garden. This will allow you to easily reach the crops from the middle rows without stepping into the raised bed. As I mentioned above, there are many materials from which you can build a raised bed. The simplest way to build a raised bed, however, is with timber boards. Four 4 feet timber boards. The ideal width of the boards is 10-12 inches while the thickness should be at least two inches. Arrange the four timber boards to form a 4 x 4 feet square. Attach the boards between them with the help of the eight large wood screws using two screws on each side of the square. If you plan on locating the square on a raised surface, such as a table, you should also fix the 4 x 4 feet timber board as a base to form a box. Fix it with the additional large wood screws. If you want to position your square foot garden directly on the ground you can skip this step. Once you have assembled the box, place the twelve small wood screws on the top edge of the box. The first screw should be placed at a distance of one foot from the corner of the box, and the distance between the screws should be of one foot too. Basically, you should have three screws on each side and a free space of one foot at each corner. Pay attention to leave the screws partially unscrewed so you can attach the nylon line. With the help of the nylon line make three lines between the two opposite sides of the box. Do the same thing for the remaining opposite sides, fixing the line around the small screws you inserted earlier. The result should be a matrix with sixteen squares of one square foot each. Now, you can place the frame or the box in a sunny spot in your garden or in your home. The next thing to do is to fill the box with the appropriate soil. Since the square foot gardens are designed for a wide variety of ﻿﻿vegetables ﻿﻿and fruits, you should choose a soil that is rich in nutrients and that can be suitable for most of the plants. Ideally, you should buy the already prepared soil from a nursery. However, if you want to brag in front of your family and friends with a 100% do-it-yourself square foot garden, you can even make your own soil. There are many soil recipes you can use, but one that is really simple to make and suitable for almost any vegetables is based on equal parts of compost, peat moss, and coarse vermiculite. All you have to do is to mix the different soils between them until completely combined, then fill the box with the soil blend. If you have difficulties in finding the above-stated soil types, you can use the simplest soil mix made of equal parts of screened topsoil and compost. If you are building your raised bed in your garden, you can even opt for building a taller raised bed and fill it with layers of organic material and soil. This method is great if you want to preserve the nutritive properties of the soil over time without adding chemical fertilizers. For this purpose, you should build a taller raised bed, of about the height of your waist. The lower layer should be made of grass and leaves clippings in a proportion of about one part grass clippings and two parts shredded leaves. You can gather this organic material directly from your lawn or buy it from a nursery. At the grass-leaves mix you can add other organic material such as wood chips, straw, and shredded bark. Fill the raised bed with these materials until you are left with about 10-12 inches. Place an untreated cardboard over the organic material then fill the box with the preferred soil mix. However, your crops need more than excellent soil. The right quantity of organic fertilizer should be added to the soil mix regularly, or you could simply add compost to the raised bed. Ideally, you should use your kitchen compost mixed with four other types of compost bought from a nursery. Once you built and filled your square foot garden with soil, the next step is to choose the vegetables and plant them into the squares. While you can choose any vegetables you want, there are a few rules to follow if you want to make sure that you’ll get the most out of your crops. First of all, you should determine how many plants you should plant in each square foot of your garden. As a general rule, you should put in each square one large plant, four medium size plants, nine small plants or sixteen really small plants. The plants should be arranged in a preset pattern. Basically, you should place one large plant in a square, then four medium plants, nine smaller plants, and sixteen really small plants in the adjacent squares. To determine how many seeds of each vegetable you should plant in each square the best thing to do is to check on the package the necessary space you should leave between two seeds. Generally, you should leave between 3 inches of space between the seeds of vegetables such as carrots, parsnips or radishes. You can plant sixteen seeds in each square foot. Larger vegetables, such as the turnips, onion, garlic, spinach, bush beans or scallions need a space of four inches between two plants. You can plant nine seeds in each square foot of your garden. In the squares dedicated to four plants should go the vegetables that need a space of about six inches between the seeds. Some vegetables you could choose are: corn, basil, lettuce, quinoa, thyme or Swiss chard. The larger vegetables, such as tomatoes, broccoli, eggplant, potatoes, peppers, asparagus, cauliflower, cabbage or celery should be planted one plant per each square foot. Besides these general rules, there are some plants that need special seeding conditions. These are the peas and pole beans, cucumbers, kale, sweet potatoes, zucchini, squashes, and melons. You should plant eight pole beans or pea plants in each square foot, while the cucumber, kales, and sweet potatoes can be planted in pairs in diagonal. The larger plants, such as zucchini, melons and squashes need two square feet each, so basically one plant will take two squares. 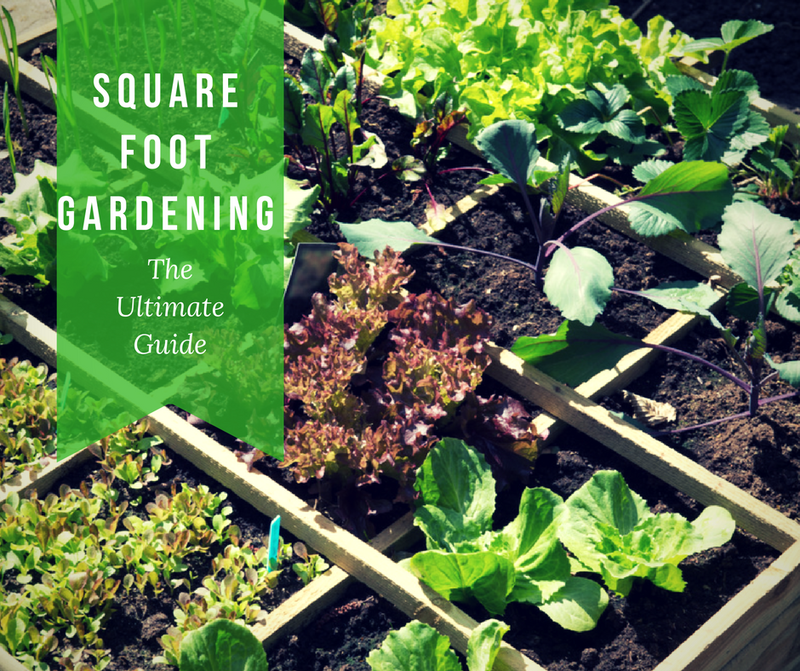 You now know the basics of square foot gardening, but if you want to impress your loved ones with your gardening skills, there are a few things you should learn if you want to choose your crops like a pro. Read the following tips to ensure that you will have an out of the ordinary garden. The beauty of a square foot garden is that it can be placed almost anywhere. Therefore, you should choose a sunny place and build your raised bed there. If it is not possible to build the garden on the ground you can put it on a table or on another type of support. Choosing the right spot for the garden is essential and a square foot garden will give you the possibility to build it near your house. There are many reasons why you should do this. The main reason is the commodity of having your vegetables close to you. In addition, having your crops next to your house will make caring for your garden easier. When creating the first square foot garden most people are tempted to overplant the vegetables they like. Still, the idea of a square foot garden is that of planting different vegetables in the right quantity. If you can plant the whole garden with carrots, for example, it is improbable that you will eat so many carrots. You should make a list with the vegetables you use regularly and plant accordingly. The rule you should remember when choosing the seeds for your square foot garden is that each square should contain different vegetables. Unless you plan to grow vegetables for your neighbors too, choose the vegetables you know that you and your family will eat. It might be tempting to plant all sorts of vegetables just because the garden looks good, but they will end up being wasted if you don’t like them. My advice is to start with the veggies you use on a regular basis and then experiment with the others over time and see if you like them or not. The square foot gardens are not only functional, but they can easily decorate your yard or balcony. To create a good-looking garden you should plan the layout of the raised bed in advance. On the internet, there are available many square foot garden layouts you can follow or you can simply use your imagination and arrange the crops in the way you like. However, when deciding which seeds go where, keep in mind that you should plant the tall plants, such as corn or beans, in the northern part of your garden if you live in the northern hemisphere (south in the southern hemisphere) to avoid keeping your other plants in shade. Don’t worry too much about not getting the best aesthetic result. Remember than in a month or two you will be able to redesign your garden. If you want to have a rich soil and healthy crops, it is a good idea to rotate the position of the crops each time you plant new seeds. In fact, planting the same vegetable in the same place can increase the chances of the new plants to develop diseases. If you worry about pests, know that you can keep parasites and insects away from your crops by simply planting a few aromatic herbs that work as natural repellents as well. Many pests don’t like much the smell of rosemary or mint, so you could simply use one square to grow such a plant. In this way, you can grow biologic healthy vegetables. For the best results, you should water your crops by hand with sun-warmed water. To do this you should use a regular watering can. As a rule, water your plants early in the morning or after sunset to avoid boiling the roots of your crops. Once you finished harvesting the crop from one square add some compost to the soil and some organic fertilizer before planting a new crop. This will enrich the soil in nutrients helping the new plant grow healthy. Even if you fill the whole box with the same soil, you can still customize the soil characteristics of each square to achieve a better result. For instance, you can add different minerals to each square based on the type of vegetable that you have planted. For example, you can add Epsom salt to the squares where are growing tomatoes or peppers. In the same way, you can customize the nutrients and minerals in each square each time you plant a new crop. Although it is really easy to create a square foot garden, there are some mistakes you should avoid if you want to achieve impressive results. Although you can place your square foot garden virtually anywhere, you should still choose the spot carefully. You should pay attention to choose a sunny spot in your yard or on your terrace because the vegetables need a lot of sunlight to grow. If you want to build the raised bed directly on the ground, pay attention to leave enough space between the fence and the raised bed or between the walls of your house and the vegetable beds. If you don’t have enough space to walk between the fixed obstacles and the square foot garden you will not be able to control weeds in the remote spots of the yard. If you have a large garden you might be tempted to build large square foot gardens. However, too large raised beds are hard to maintain. If you want to build large gardens you should choose a layout that is long rather than wide and ensure that you can easily reach all crops without having to step on the raised bed. Ideally, the raised beds shouldn’t be wider than four feet. Before deciding how many seeds you can plant in each square you should learn which are the requirements of each plant. If a square is too crowded the plants can harm each other during growth minimizing the crops. This might not be a problem if you build your raised bed directly on the ground, but if you want to place your square foot garden on a table you should consider the drainage as well. Stagnant water can damage your plants. On the other hand, watering your crops too little or irregularly is another mistake you can make. The best way to water your crops is by hand with a water can each day, ideally after sunset. You should avoid watering the garden when the sun is shining, especially if you placed your square foot garden on a table. Square foot gardening is not all sugar and spice and everything nice, there are some downsides too. Let’s see which are the main advantages and disadvantages of this type of gardening. Require little space: you can build your raised bed virtually anywhere, even on a sunny terrace or balcony. This is a great advantage as it enables anyone to create a garden and grow biological veggies. Accessible: if you suffer from any knee problems you just have to build your square foot garden on a high enough table. In this way, you will not have to bend over to care for your crops. Easy to maintain: the square foot gardens are usually small and easy to maintain. They are virtually weed-free while keeping pests away is easy. You will not have to use heavy gardening tools and the time you have to spend for the maintenance work is minimum. Excellent soil: if you decide to use the soil mix recommended by Bartholomew you will have a garden with a rich soil that is ideal for the vast majority of vegetables. In this way, you will not have to use any fertilizer other than compost before planting a new crop. Simple to create: the square foot gardening is really appealing especially for the newbies because the method is simple to follow. There are many ready-to-use square foot garden designs that can help you decide what type of plants to grow and where to position them on the matrix. Produce many different vegetables in a reduced space: if you want to grow a variety of vegetables but don’t have space, square foot gardening might be the solution. You can grow at least sixteen different vegetables at the same time in a 4 x 4 feet box. High setup cost: you will have to invest in the necessary materials to build your raised bed (or beds), as well as in soil and seeds. Unsuitable for large root crops: even if it is possible to grow carrots or potatoes in a square foot garden, keep in mind that you will have to harvest your vegetables while they are still young. Therefore, you will probably eat baby carrots and small potatoes especially if you don’t build the raised bed directly on the ground. Require regular watering: because this type of gardening doesn’t imply using an irrigation system you will have to water your crops by hand regularly. This might not be a problem if you have a standard size bed, but if you build a large square foot garden the watering operation might require a lot of time. Wood boxes need to be replaced over time: as I said above, you can build your raised beds in a variety of materials, including concrete or bricks. However, the handiest solution is that of building a timber box. The downside of this option is that the constant humidity will damage the wood in the long run, so you will probably have to change the boxes from time to time. The soil must be replenished: if you have a square foot garden it is recommended to replenish the soil at least once a year. This will increase the maintenance costs of your garden. Despite the disadvantages mentioned above, square foot gardening is still an awesome gardening solution accessible to virtually anyone. In addition to being accessible, this type of gardening will also give you the possibility to experiment with the crops while growing your own biological vegetables. In addition to these advantages, the square foot gardens also look good, representing a stylish decorative element that is both beautiful and functional. But what I particularly like about the square foot gardening is the versatility. The crops are replaced on a regular basis, giving you the opportunity to eliminate the vegetables you don’t like or to experiment with new veggies you haven’t tried before. Another thing I like is the ease of growing tasty vegetables and herbs. The solution is ideal for the beginners, while the square foot gardening can also represent a fun way to teach children the art of gardening. Now, all you have to do is to follow the tips presented in this guide and build your own square foot garden. We recommend that you take a few days to get this project completed - labor day weekend could be a perfect time for example. Leave a comment below to let me know what vegetables you planted and if you are satisfied with your crops. If you have any questions or suggestions, comment below, I would love to hear your thoughts. And if you liked this article, share it with your friends. They might find out that square foot gardening is a solution for them too.